It takes about an hour for us to drive to work each morning and then home again. My husband drives and I usually observe all the stuff I'd love to stop and photograph. But, alas, I'm not the driver. Probably a good thing, because I may never make it to work in the morning or home in the evening. Before you know it, you'd see my face on milk cartons. Today, I noticed some wonderful clouds in the sky. As the sun started its decent I knew we were in for a beautiful sunset. And I was right. I watched it unfold through my window and the sideview mirror. I could feel my anxiety build. I hadn't been to the lake since January 30th. Of course I had my camera with me and my tripod was in the car, too. Maybe we could make a quick trip to the lake tonight. As we neared the sitter's house, I could see the magnificent fireball building in the sky. Layers of clouds looked like spun gold...and I was missing it. So, I asked if maybe we could make a quick trip to the lake after picking up the kids...Nope. Not happening. Too tire...No problem, as soon as we get home I'll drive out...and I did...I was racing against the clock once again to beat the sun to its final destination...my five minute drive seemed to stretch on forever...my chances for catching today's magical sunset were fading as was that spectacular glow...eventually I drove down the lake road, parked at the launch, grabbed all my gear, got my camera mounted on the tripod head (my first time, I might add) and snapped away as quickly as I could. Time was of the essence. By the time I got this picture, the brilliance had faded... and along with it the stresses of a Monday in the corporate world. This photograph won't win any awards, but photography has won my heart. This is what it's all about. Feeling that moment of peace and tranquility. And capturing that moment to share it with others. 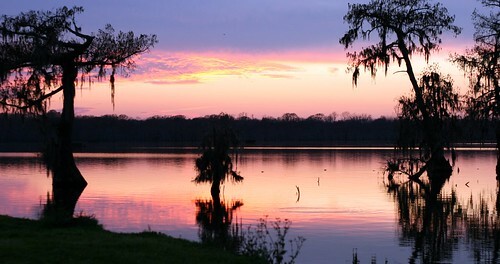 Photo taken at Lake Martin, Cypress Island Preserve, Breaux Bridge, Louisiana, on February 16, 2008. Louisiana has some of the best sunsets on Earth.